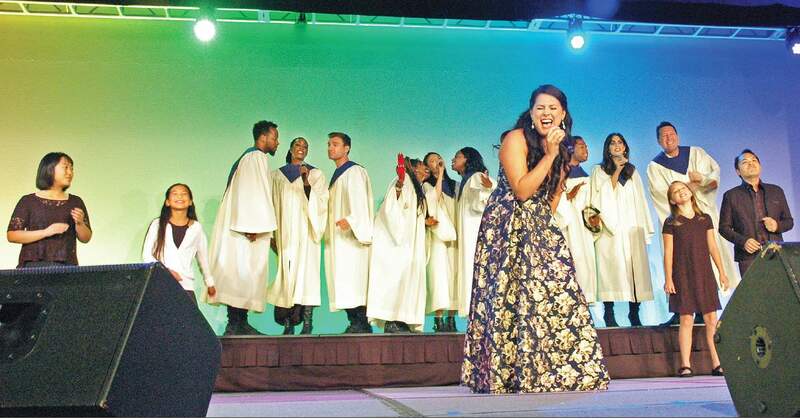 Music and memories lift Go For Broke’s annual fundraising gala. 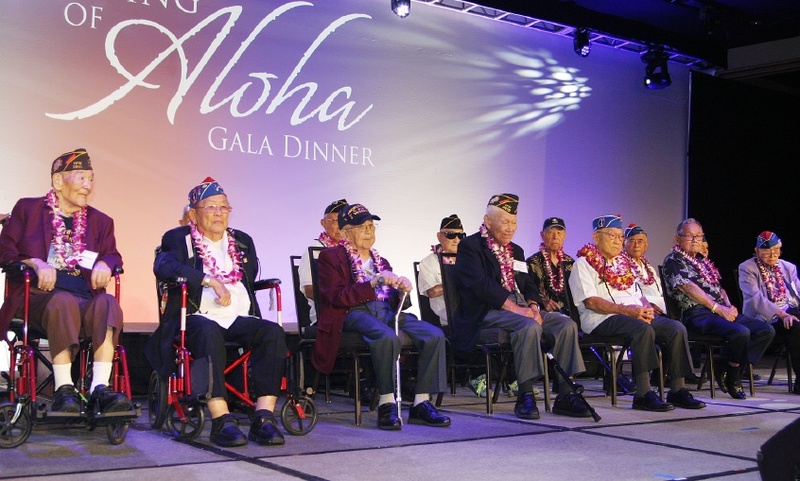 Veterans of the 100th Infantry Battalion, 442nd Regimental Combat Team and Military Intelligence Service were recognized at the beginning of the program. 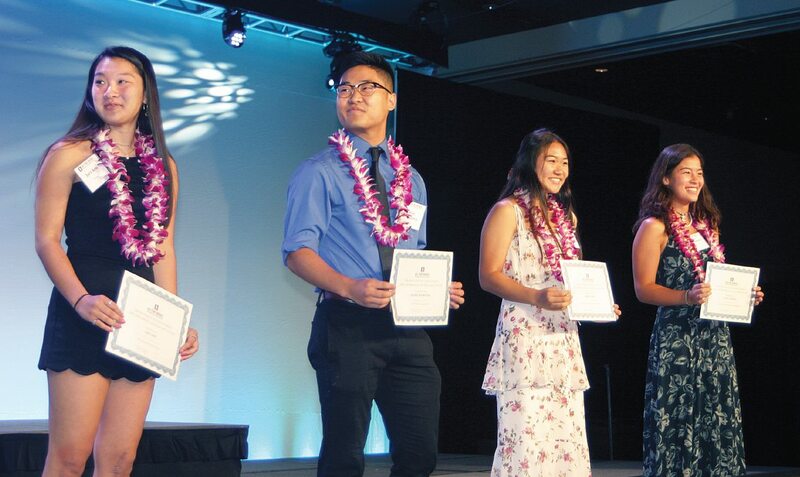 The Go For Broke National Education Center commemorated significant anniversaries in Japanese American history at its 17th annual Evening of Aloha gala dinner, held Sept. 8 at the Westin Bonaventure Hotel & Suites in Los Angeles and attended by nearly 800 people. ABC7 Eyewitness News anchor David Ono returned as emcee. With “Okage Sama De” (Because of You, I Am) as the theme, the fundraiser marked the 75th anniversary of the 100th Infantry Battalion’s first exposure to combat and the formation of the 442nd Regimental Combat Team, as well as the 30th anniversary of the Civil Liberties Act of 1988. The evening was an expression of gratitude to the veterans and others who made redress possible. Veterans of other wars and active-duty military personnel who were present, as well as wives, widows and sisters of Nisei vets, were asked to stand up and be recognized. The many veterans who have passed away since the last Evening of Aloha were saluted in an “In Memoriam” video. 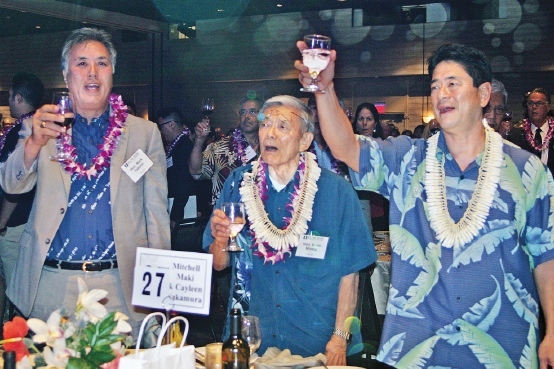 Rep. Mark Takano (D-Riverside), former Secretary of Transportation Norman Mineta and GFBNEC CEO Mitch Maki join in a toast. In keeping with the Hawaiian theme, hula entertainment was provided by Staci Toji and Lane Maki. The menu was created by Roy Yamaguchi, chef, founder and owner, Roy’s Restaurants Worldwide; Akira Hirose, chef and owner, Maison Akira (Pasadena); and Jeremy Choo, innovation pastry chef, King’s Hawaiian Bakery & Restaurant. The evening’s culinary team also included Raymond Nicasio, executive chef, Westin Bonaventure; Garrett Mukogawa, corporate executive chef, Roy’s Restaurant, Hawaii; Charles Andres, executive chef, Humble Market Kitchin, Wailea Maui; and Randy Bangloy, executive chef, Eating House 1849, Honolulu. 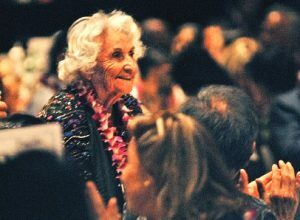 Sumi Seki, wife of WWII veteran Don Seki, and other spouses were applauded for their own dedication and sacrifice. The emcee was David Ono of ABC 7 Eyewitness News and the dinner co-chairs were Terry Hara, retired LAPD deputy chief; Akiko Maloney, clinical pharmacist, Keck Hospital of USC; and Nancy Okubo, vice president and segment manager, MUFG Union Bank, who delivered greetings on behalf of the co-chairs. 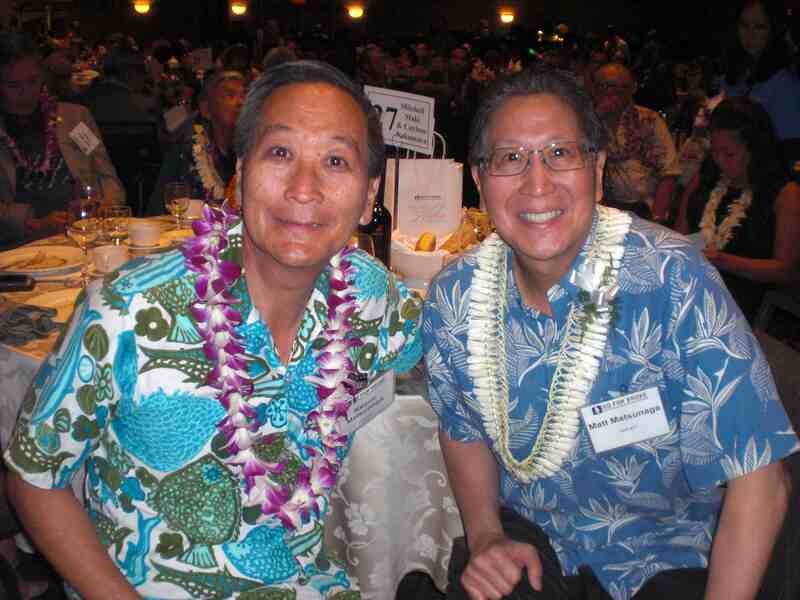 Stephen Kagawa, GFBNEC board chair, said that while growing up he knew nothing about his family’s incarceration during World War II or the accomplishments of the Nisei soldiers, but he has since learned about “the steadfast character of our people” and “the sacrifices of bloodshed” that made possible the life he enjoys today. Kagawa introduced the Okage Sama De Award recipients, who “gave unselfishly of their time, of their talent and of their resources” to make two projects a reality: the Go For Broke Monument and GFBNEC’s move to the former Nishi Hongwanji building in Little Tokyo. 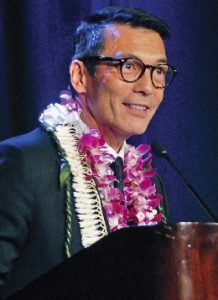 Bruce Kato is president of Gardena-based Kato Construction Management Inc., which coordinated all construction activities, including planning, for the monument, which was unveiled in 1999. 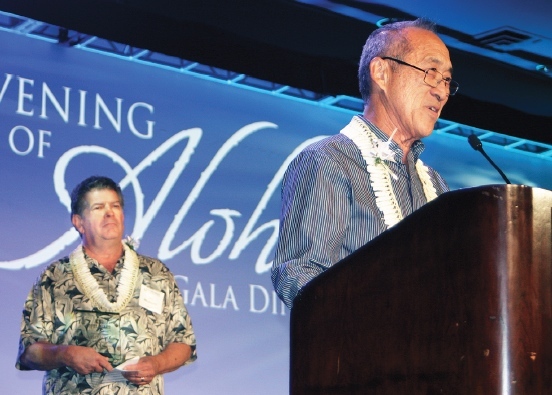 Jim Wellbaum, the owner of Triwell Properties Inc., a real estate investment and asset management company, facilitated GFBNEC’s move from Torrance to Downtown L.A.
Bruce Kato (at podium) and Jim Wellbaum received the Okaga Sama De Award for contributions to GFBNEC. Also recognized were Hiroaki Hodai, a Japanese businessman who happened to visit the Go For Broke Monument by chance and after meeting veterans there, has come back from Japan to help clean the monument several times over the years; and Councilmember Jose Huizar, who has helped GFBNEC with a proposed new building. Ono announced some of the winners of the 2018 student contests: Sara Aoki (first place, essay, high school), Kahlil Kochiyama (first place, essay, college), Sarah Ando (first place, visual arts, high school), Aislinn Ozawa-Burns (first place, visual arts, college), Paiton Gleeson (first place, performance, high school), and Hope Fa-Kaji (first place, performance, college). The other winners are: High school — Joseph Vega (second place, essay), Vincent Ooi (third place, essay), Kea Kamiya (second place, visual arts), Mira Hirabayashi (third place, visual arts), Lora Gatiuan (second place, performance), Michael Eberlein (third place, performance). College — Aodhan Ozawa-Burns (second place, essay), Thao Nguyen (third place, essay), Caitlyn Takeda (second place, visual arts), Kayla Yoshitake (third place, visual arts). Student contest winners (from left) Sara Aoki, Kahlil Kochiyama, Sarah Ando and Paiton Gleeson. The contest is sponsored by Pacific Global Investment Management Company in memory of community philanthropists and business leaders Manabi Hirasaki and Sig Kagawa, Ken and June Shimabukuro, and an anonymous donor in memory of 100th Infantry Battalion veteran Masao Takahashi. Posthumous honors went to Sen. Spark Matsunaga (D-Hawaii), who served in the House of Representatives from January 1963 to January 1977 and in the Senate from January 1977 until his death in April 1990 at age 73. A veteran of both the 100th and the MIS, he was wounded twice and attained the rank of captain. Norman Mineta, who served in the House for two decades before becoming a Cabinet secretary under Presidents Bill Clinton and George W. Bush, spoke of his former congressional colleague. Keith and Matt Matsunaga, sons of the late Sen. Spark Matsunaga. Matt accepted the Defining Courage Award on his father’s behalf. “If it weren’t for the valor of the 100th, 442nd Regimental Combat Team and the MIS … we never would have been able to pass HR 442,” he said, referring to the redress bill. “I am forever indebted to all of you for your service and those who made the ultimate sacrifice. “When I arrived in the U.S. House of Representatives in 1974, Spark Matsunaga had already been there 12 years and was one of the most popular legislators in Congress. Whether you were a Democrat or a Republican, people had only kind words for this man who had dedicated his life to serving the United States of America. He took me under his wing and showed me the ropes. He was truly a big part of my beginning in Congress. Noting that the JACL first passed a redress resolution in 1970, he said that it took “18 years of hard work and late nights to pass the Civil Liberties Act of 1988” and that his father applied his philosophy to make redress a reality. 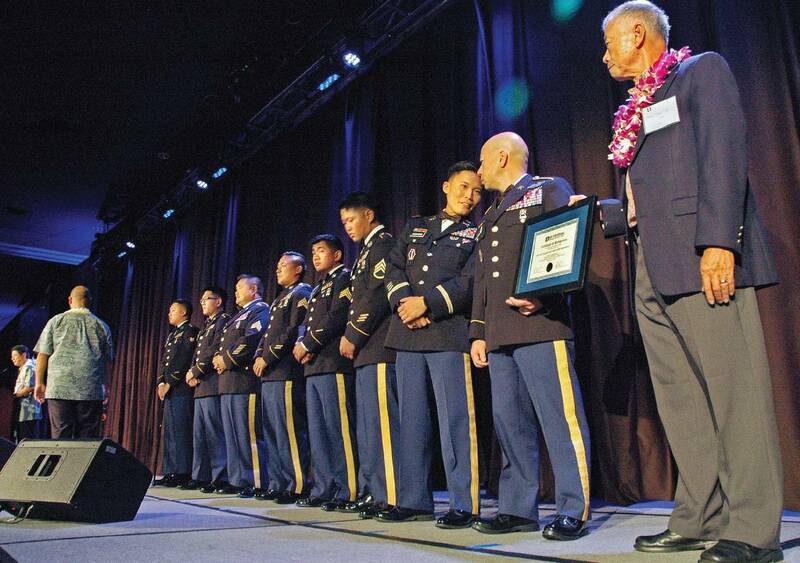 The 100th Battalion, 442nd Infantry Regiment from Hawaii received a certificate of appreciation from GFBNEC. 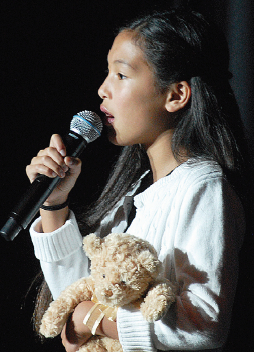 Sabrina Wong performs a heartfelt song on stage. Kincade performed in a piece about the Japanese American wartime experience and sang “This Is Me,” from the movie musical “The Greatest Showman,” along with supporting cast members Randy Guiaya, Sabrina Wong, Akiko Maloney, Aimee Machida Angeles, Elizabeth Guyer, Gwyn Foxx, Jennifer Winkler, Marisa Rambaran, Miko Shudo, Miyuki Miyagi and the Raise Choir. The program also include a “Fund the Future” appeal by Maki and Wong, which raised about $107,000 from members of the audience. An opportunity drawing was overseen by Maki, Kagawa, Kacey Takashima, and Steve Morikawa, vice president of corporate relations and social responsibility for American Honda Motor Co. Inc., the gala’s presenting sponsor. The winner of a 2018 Honda Pilot was Amy Wilson of North Hollywood.